South Family Dental takes pride in creating a luminous smile with South Calgary Porcelain Veneers to enhance or change the look of your teeth. Veneers are thin shells of porcelain that are bonded to the front of your tooth to improve the color and shape of the teeth. When teeth are chipped, misaligned or are beginning to wear, veneers are used to protect teeth from additional damage and while restoring or enhancing their original appearance. 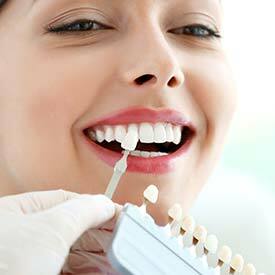 Thanks to veneers, a complete smile is possible. Because porcelain veneers fit over the front of teeth, Dr. Angela Sharma and her team can transform your smile with veneers to conceal any and all of the imperfections you may have. Porcelain veneers are also used to camouflage cosmetic problems on teeth that have a relatively correct natural size, shape, and alignment. 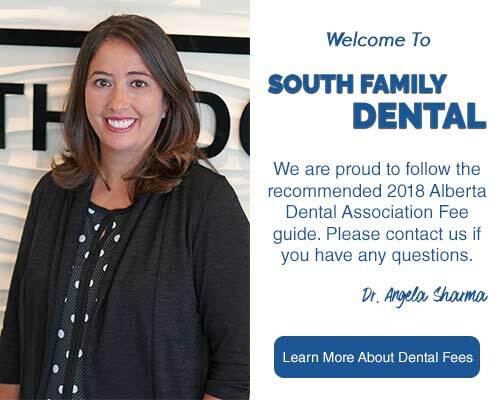 At South Family Dental Care we understand that you may be dissatisfied with your smile and may avoid seeking treatment because you do not want to wear traditional braces. Veneers can also replace orthodontic treatment in many cases because they are used to reshape crooked teeth that may otherwise require orthodontic treatment. We know that your smile is important to you and changing the look and aesthetics of your teeth with Veneers is one of the many dental health services that we offer at South Family Dental Care. Call us at (403) 262-3235 to book your Porcelain Veneers Consultation with us today!